So i got these palettes for my birthday back in march, how super fast did that go. This is the Urban Decay Roller Girl palette. The palette contains four beautifully pigmented eyeshadows three neutral shades verve, suspect and darkhorse. These shades are perfect for creating that smokey eyed more neutral look or a more toned down one depending on what you fancy. 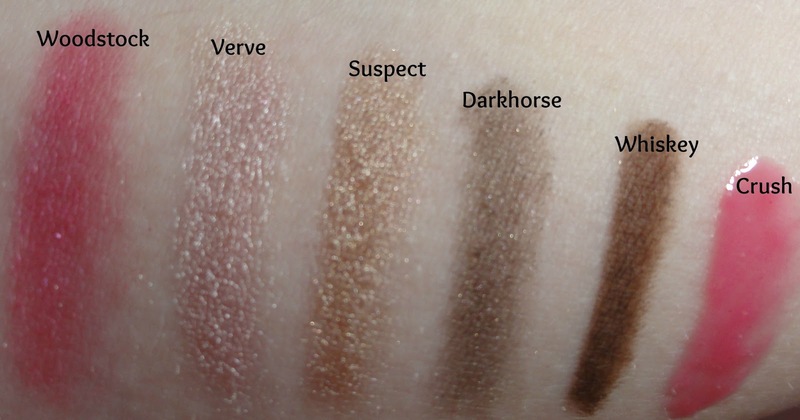 Verve and suspect are quite metallic looking with darkhorse being less so. I think woodstock is a great addition to the roller girl palette it's a beautiful pink which is a fun pop of colour and something i wouldn't wear alone but for that pop of colour to create a fun eye look it's perfect. Whiskey is a miniature eyeliner it's very pigmented i personally wouldn't wear it on my lash line but i probably will on my eye lids near the lashes. Crush is a additional bonus to this palette a lovely lipgloss. I didn't find it to be sticky and it really adds that lovely pop of colour to a everyday look and will look great with a more toned down, neutral look with a pop of colour on the lips. This is £14.95 at cheap smells. This is not to big either making it the perfect addition to pop in your travel bag on holiday. I don't know about you but me personally likes to have a really toned down neutral shades whilst on holiday with just a pop of colour on the lips. Keeping it quite simple. The fact it comes with a built in mirror makes it perfect. The packaging is absolutely gorgeous. Woodstock is a dark fuchsia pink with a soft frost finish. Very pigmented, super smooth. This is permanently available. Verve is a pale, muted taupe brown–like a lighter Mushroom. This is an exclusive shade to this palette. Suspect is a muted champagne bronze with a frost finish. This shade was in the Book of Shadows, Vol. III. Darkhorse is a dark, sultry bronze shimmered brown. This shade was in the Naked and Feminine palettes. I also got this for my birthday for just £19.45 from cheap smells also. 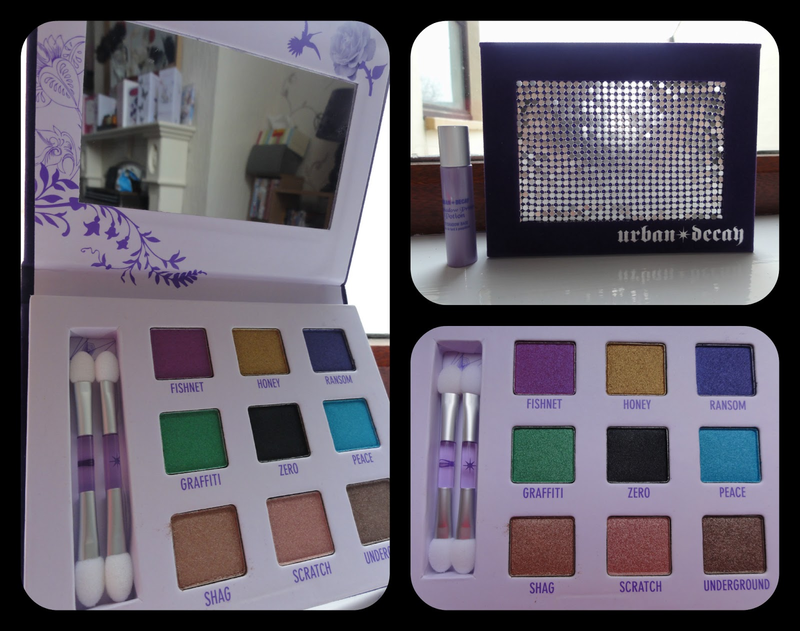 Not going to lie when i purchased both these palettes on behalf of my mum they were a little cheaper i think at the time. This fun and as a quite a disco feel to it. With the shiny silver mesh in the middle - very disco ball. It comes in a suede type compact with another built in mirror. Inside are two basic applicators, i haven't used these because i have my own brushes like all girls. It comes with a rainbow of colours including neutral shades and pop colours. This palette is perfect for them who are very adventurous and love colour. The amount of looks you would be able to create with this is fabulous. Have not played around with this one to much. The photos didn't do much justice at the time, but they are more vibrant and bold when applied. This also came with a small travel size Eyeshadow Primer Potion. I haven't even opened this because eyeshadow primers for me i'm a little unsure of, have tried one and i wasn't overly keen but i think i will give it ago again sometime. You have loads of shades now to create a weekly make up look ;), xoxo. Haha, photographers do the same. That's really good, writing your own book, good luck, xoxo. Don't say that hun! Have faith, its all about networking anyway, you just need to find a publisher, xoxo. Carry on writing, it'll be great to make a career out of something you love to do, xoxo.